On Saturday, October 13, His Eminence, Metropolitan Hilarion, flew in to lead the parish celebrations in Rochester, NY – this year, the patronal feast of the Protection of the Mother of God Church fell on Sunday, which added to the solemnity of the holiday. 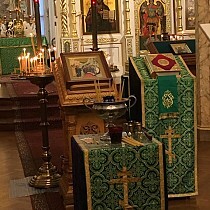 At All-Night Vigil in the church, His Eminence was co-served by parish rector Archpriest Gregory Naumenko, Abbot Theophylact (Clapper-DeWell; cleric of Holy Trinity Monastery in Jordanville, NY), Priest John Boddecker (rector of Sts. Theodore Church in Buffalo, NY), parish Protodeacon Andrei Strapko, and the brother-deacons, Andrew and George Hammond (clerics of Sts. Theodore Church). Protodeacon Nikifor Franklin, now assigned to St. John of Kronstadt Memorial Church in Utica, NY, returned with his family to join the celebration. 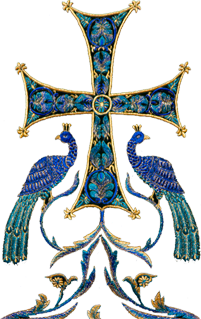 On the very day of the feast, during the reading of hours, Reader Stefan Stoyanov was elevated to the rank of subdeacon, and Daniel Watkins was tonsured to the rank of reader for Sts. Theodore Church. At the Little Entrance, Fr. Andrew Hammond was awarded the double orarion. Throughout the services, the parish choir sang with inspiration and solemnity. The trios were beautifully sung by Elizabeth Prokopienko, Alexandra Strapko, Maria Huber, and Elizabeth Franklin, Melanie Reff and Andrew Lahnovych. Upon conclusion of Divine Liturgy, after the procession around the church, head sister Irina Parker, on behalf of the entire parish, presented Fr. Gregory with a beautiful pectoral cross with the inscription: "To Fr. Gregory, on the 35th anniversary of his ordination, from his loving flock." Fr. Nikifor presented the Metropolitan with a palitsa, embroidered marvelously with an icon of the Theotokos. After the service the sisterhood invited everyone to a festal luncheon. Having been nourished both spiritually and physically, and having bidden farewell to their dear Vladyka Metropolitan, everyone dispersed. Under the Protection of the Most Holy Mother of God, the celebration was truly beneficial for all. The parish sincerely thanks all those who labored in the preparation for and during their patronal feast.